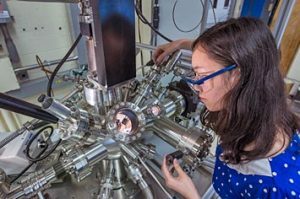 Brookhaven National Laboratory scientists have discovered a new nanostructured metal-oxide catalyst with a significantly higher activity than any other catalytic systems currently in use for converting carbon dioxide (CO2) to methanol. The scientist claim that the new catalyst could help overcome hurdles of using CO2 as a starting point in producing useful products. Methanol is considered to be a key commodity for creating a wide range of industrial chemicals and fuels. With its significantly higher conversion activity, the new system could make it easier to get normally unreactive CO2 to participate in these reactions. “Developing an effective catalyst for synthesizing methanol from CO2 could greatly expand the use of this abundant gas as an economical feedstock,” said Brookhaven chemist Jose Rodriguez, who led the research. It’s even possible to imagine a future in which such catalysts help mitigate the accumulation of this greenhouse gas, by capturing CO2 emitted from methanol-powered combustion engines and fuel cells, and recycling it to synthesize new fuel. That future, of course, will be determined by a variety of factors, including economics. “Our basic research studies are focused on the science—the discovery of how such catalysts work, and the use of this knowledge to improve their activity and selectivity,” Rodriguez emphasized. The scientists used spectroscopic techniques to investigate the interaction of CO2 with plain copper, plain cerium-oxide, and cerium-oxide/copper surfaces at a range of reaction temperatures and pressures. This was done in a bid to explore the reactivity of such dual particle catalytic systems in converting CO2 to methanol. Furthermore, chemical fingerprinting was combined with computational modeling to reveal the most probable progression of intermediates as the reaction from CO2 to methanol proceeded. The studies in turn revealed that the metal component of the catalysts alone could not carry out all the chemical steps necessary for the production of methanol. The most effective binding and activation of CO2 occurred at the interfaces between metal and oxide nanoparticles in the cerium-oxide/copper catalytic system. “The key active sites for the chemical transformations involved atoms from the metal [copper] and oxide [ceria or ceria/titania] phases,” said Jesus Graciani, a chemist from the University of Seville and first author on the paper. The resulting catalyst converts CO2 to methanol more than a thousand times faster than plain copper particles, and almost 90 times faster than a common copper/zinc-oxide catalyst currently in industrial use. The study goes on to illustrate the substantial benefits that can be obtained by properly tuning the properties of a metal-oxide interface in catalysts for methanol synthesis.